A global citizen, entrepreneur and Sherpa guide has released her revolutionary approach to re-discovering the self, re-defining the way life is meant to be lived and revitalizing personal potential and purpose. In “How Me Found I,’ author Abigail Diaz Juan emphasizes the use of fear as a transformative experience and equips readers with the necessary skills to turn moments of negativity into opportunities for spiritual development, personal empowerment and ultimate fulfillment in life as they move forward toward their desired and natural reality. 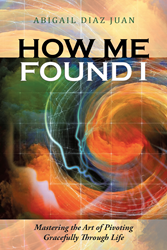 Inspired and guided by Juan’s own journey through burn-out, life transitions and spiritual rebirth, “How Me Found I” encourages readers to reject the status quo of life, become aware of and harness their personal power and transform their reality to one that is desirable, natural and fulfilling. Abigail Diaz Juan is a global citizen, world traveler, entrepreneur, Sherpa guide and the founder of the Diamond Quest Company. The daughter of a diplomat in Afghanistan, Juan experienced great prosperity in her early career in international finance, marketing and business strategy. After a spontaneous kundalini awakening, Juan’s professional success gave way to her spiritual quest for deeper understanding of the Universe as well as her passion for helping others on their own journey to personal fulfillment. Her next book is slated for release in 2019. To learn more, please visit http://www.mydiamondquest.net.